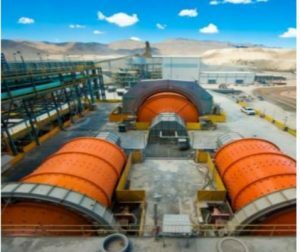 MEXICO – Vancouver-based Goldcorp has poured the first gold at its Penasquito’s Pyrite Leach project (PLP) in Zacatecas. Commissioning of the plant began in Q3 2018, and it is now treating existing tailings around the clock. The new leach plant is expected to recover about 35% of the gold and 42% of the silver that makes its way into the tails. The PLP treats the tailings and then feeds into a flotation and leach circuit followed by a Merrill Crowe circuit. Eventually, 1 million oz. of gold and 45 million oz. of silver could be recovered this way. Goldcorp said the carbon pre-flotation circuit (CPP) reached commercial rates on Oct. 1, 2018, and it has exceeded initial performance expectations. The CPP circuit treats 6 million tonnes of high carbon ore. It de-risks the tailings and gives the company the flexibility to sequence various ore types. It currently consists of three stages of floatation to remove organic carbon from the cyclone overflow be the lead flotation circuit. Watch the time lapse video of the PLP circuit construction during 2017 by clicking here.